The first time I saw visvamitrasana (an arm-balancing asana named for the sage Visvamitra), I was captivated. 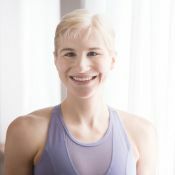 I was a new-ish practitioner in my early 20s, thumbing through one of my yoga magazines, when I spotted a beautiful photo of Seane Corn, a yoga teacher I recognized, effortlessly demonstrating a super-cool-looking pose that I most definitely did not recognize. Curious to learn more about this fascinating asana (not quite a standing pose and not quite an arm balance), I did what any self-respecting Millennial would do: I asked the internet. Once I learned the pose's name (visvamitrasana) and scrolled through a few more photos for inspiration, I was eager to try it myself. My initial attempts at home were less than successful. But as luck would have it, visvamitrasana happened to play a starring role in many of the workshops and classes I attended soon thereafter. Despite my initial intrigue, I quickly discovered that I really, really did not like this pose. You see (and I'm guessing I am not alone in this), I have this tendency to want to be good at things right away. And I was most definitely not good at visvamitrasana right away. Meaning every time I attempted it, I would fall flat on my bum. And (as tends to be a typical reaction when one falls flat onto one's bum), I'd get super-frustrated, embarrassed, and annoyed, wishing that the teacher would get on to the next pose already. But luckily, I had some pretty good teachers (so good, in fact, that I kept showing up in spite of all the visvamitrasanas they would ask me to do). They taught me ways to approach this pose that weren't so frustrating or scary, and to break down, step by step, what once seemed an insurmountable challenge. Even more importantly, they reminded me that the pose itself isn't so much the point. Here's the thing—the thing that visvamitrasana and other challenging poses constantly remind me: Asanas aren't obstacles to be conquered, prizes to be won, or accomplishments to check off some grand yogic to-do list. Rather, they're tools we can use to get to know ourselves a little better—to learn how to observe and honor our bodies, to discover where we feel especially strong and/or flexible, where we feel not so especially strong and/or flexible, how we respond when we feel pissed off or agitated, and the ways in which we change, and learn, and grow over time. Asanas aren't obstacles to be conquered, prizes to be won, or accomplishments to check off some grand yogic to-do list. Rather, they're tools we can use to get to know ourselves a little better. Here are some alignment tips and variations of visvamitrasana, many of which helped me to make a pose that was once baffling and discouraging a lot clearer, more accessible, and empowering. This variation looks similar to the classic visvamitrasana, although it does not require working the shoulder over the leg—making it more accessible for those who feel restricted by tight hips, or who struggle to balance in the pose. For me, working with this variation gave me my very first inkling that visvamitrasana might not be as impossible as I'd thought. From downward facing dog, inhale your right leg up into a three-legged dog. If you like, you can play with a knee-to-chest flow to build strength. Exhale, bending your right knee in toward your chest. Inhale, back to three-legged dog. Exhale, bringing your right knee to your right outer upper arm. Inhale, back to three-legged dog. Exhale, bringing your right knee to your left upper arm. Inhale, back to three-legged dog. Repeat. Or you can move directly to step 2. From three-legged dog with your right leg lifted, on an exhale, bend your right knee and bring it forward and across your body to touch (or come as close as it can to touching) your left upper arm or elbow (depending on your proportions). Spin your left foot flat to the floor (as you would for warrior II or side-angle pose). Bring your left hand to hold just below your right knee, and hug your right knee up a little higher toward your chest. With your left hand, catch hold of the pinky-toe side of your right foot. Now begin to extend your right leg out to the side (your leg doesn't have to straighten all the way). Maintain some connection between your torso and thigh so that you don't overstretch, or stretch only the most flexible parts of your hamstrings. Spin your belly, rib cage, and chest up toward the sky. If you feel stable, and it's comfortable for your neck, you can also turn your head to look up. When your exploration is complete, return to three-legged dog with your right leg lifted, then downdog, then repeat on the second side. For this variation, you'll work your shoulder under your front leg, but from a position that's closer to the ground and a little more stable than the traditional visvamitrasana stance. Start in a lunge with your right foot forward and your left knee down. Bring both hands to the inside of your right foot. Turn your left toes to the right, assuming a kneeling warrior II position. Work your right shoulder under your leg. I find it helpful to first walk my right foot a little more to the left (toward the center of my mat), which provides more stability in the pose later on. To work your shoulder under, bring your right hand to the back of your calf and lift the flesh of your calf up. Then move your right thigh back (out toward the right) to make space to work the shoulder under. Continue to work with these actions: calf up, thigh back, shoulder under. If you feel stuck, try lifting your right heel off the floor, which will allow for more hip mobility. Continue to work calf up, thigh back, shoulder under until you're as “under” as you can be. With your right shoulder under your thigh, plant your right hand flat on the floor, outside of your right foot. Press your right leg against your right arm and your right arm against your right leg. Now here's the tricky part: Without using your right hand, lift your right foot up off of the floor. Feel impossible? Try this: Bring your left hand up onto your left hip. Now see if you can lift your right foot. If your right foot is up off of the floor, hold the pinky-toe side of your right foot with your left hand by reaching your hand over the top of your right foot. Activate your deep abdominals by engaging between your two front hip points (as if you were cinching a drawstring), and move your inner thighs back. Keep that, and lift up through your low belly as well. Maintain your arm/leg connection and extend your right leg. Here too, it doesn't have to extend all the way. Draw your right hip under, externally rotating your right leg. Spin your belly, rib cage, and chest up, perhaps also turning your head to gaze upward. To release, bend your right knee, come back to a lunge, and unwind. Then change sides. The classic form of the pose is essentially the combination of the two previous preps: The back leg is straight (like prep I), and you work your shoulder under your front leg before extending it (like prep II). Set up your legs as you would for warrior II or side-angle pose, and walk both hands to the inside of your front foot. As with the previous variation, lift your right calf and snuggle your shoulder under your leg: Lift the flesh of your calf up, move your right thigh back (out to the right), and work your shoulder under your thigh. Once you're snuggled in as much as you can, plant your right hand flat on the floor outside your right foot. Hug your arm and leg against one another. Lift your right foot off of the floor without using your hand. Try bringing your left hand up to your hip to make this easier. If your right foot is off the floor, catch hold of the pinky-toe side with your left hand. Begin extending your right leg. Keep your shoulder/leg connection. Engage between your hip points, move your inner thighs back, and try to maintain a bit of torso/thigh connection as you begin to straighten your leg. Lift up through your low belly, and work your right hip under, finding more external rotation in your front leg. Spin your belly, ribs, and chest up toward the ceiling. Gaze straight ahead, or turn your head to look up. Stretch your legs apart from each other. Then bend your front knee, release back to a lunge, and repeat on the other side. I first discovered this variation about two years ago when I noticed it popping up all over Instagram. It's essentially a hybrid of visvamitrasana and goddess pose (a wide squat). It's a creative twist on an old-favorite, and I personally find it a little more stable and accessible than the classic visvamitrasana. Begin by standing in tadasana (mountain pose). Separate your feet wide, at least mat-width apart, and turn your toes out so that your knees and toes point in the same direction, bending your knees and bringing your fingertips to the floor. Lift your right heel up off of the floor, bring your right hand to your right calf, and start to work your right shoulder under your right leg. Lift your calf up, move your right thigh back, and work your shoulder under. Keep your right heel lifted as you plant your right hand down on the floor and bring your left hand over the top of your right foot to grip the pinky-toe side of it. Then, at the same time, shoot your hips back and extend your right leg (here, too, it doesn't have to straighten all the way). Continue to externally rotate your right leg as you twist open toward the left, spinning your belly, rib cage, and chest up. To come out of the pose, turn your chest down, bend your right knee, release your foot, untwist, and come to uttanasana (standing forward bend) before repeating the pose on the other side.